By the time the Cheltenham Festival is reaching its fourth day, it is often brimming with excitement. There has already been some bruising action on the old course and the New Course is warmed up for the final day of the annual adrenaline-inducing event. The Triumph Hurdle prides itself on being one of the few races that headline the festival’s final and most explosive day. This race brings together horses of strictly four years of age to compete in covering a 3,240 metres (2 mi 1 furlong) distance on the left-handed new turf course. The hurdle race ranks among National Hunt’s Grade 1 races and included eight challenging hurdle obstacles on the racehorses’ path. The novice hurdlers fight it out for a purse of around £120,000 with the winner pocketing upwards of £60, 000 coming from current sponsor JCB. 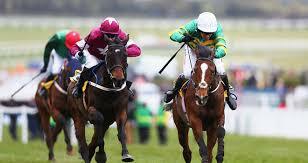 As the curtain raiser of the final day, the Triumph Hurdle always has a lot to live up to. It makes or breaks the day’s mood. Jockeys know this too well and appear to make it known to their beasts. This race has been a regular feature at the festival having been first run here in 1968. Its exact birth date, however, is 1939. It was initially held in Surrey and admitted even French-trained horses. When it first moved to Cheltenham in 1965, it was run in April. The World War II broke immediately after its onset and it had to be suspended for nine years. 2001 was the only year of no action since it moved to Cheltenham. The Triumph Hurdles’ records have all been set in the 21st century. Leading Jockey Barry Geraghty has had his five wins spread evenly in 2003, 2009, 2010, 2015 and 2016. Leading trainer Nicky Henderson has had his wins even more evenly spaced (1985, 1987, 1999, 2009, 2010 and 2015). The age categorisation obviously prevents any horse from winning it twice.